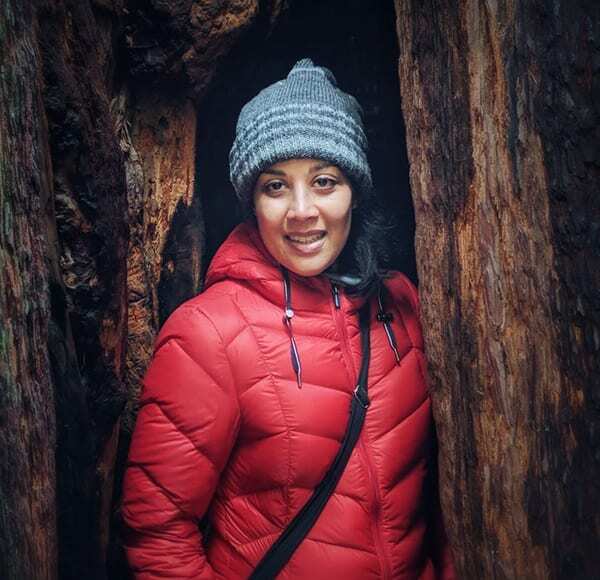 Merziyah Poonawala pauses during a hike through Muir Woods, near San Franciso, CA. When Merziyah Poonawala arrived at Rice University in August 2000, she knew she was going for a Computer Science major and wanted to learn Spanish. Which meant signing up for COMP 201 and SPAN 101. Her interest in Computer Science stemmed from the influence of her father and her fascination with the logic that drove computer software. However the subject was new to her as she had very limited coding experience. The CS alumna (B.A. ’04) said, “COMP 201 was taught using Scheme, which wasn’t then a popular mainstream programming language and that helped level the playing field in the introductory course as everyone was learning the language along with the concepts. The next course, however, was taught using Java and the class got intimidating quickly. There was one female TA in the class who understood her struggles and patiently explained concepts. “Without her help I’m not sure I’d have gotten through the course,” said Poonawala. In her class, only five of the 24 CS students were women. They were scattered across the eight residential colleges and rarely saw each other outside of lectures. The department chair, Moshe Vardi, realized he had a problem. She and Logan approached Dr. Lydia Kavraki, one of the two female CS faculty members, to be the club’s sponsor. They decided on a name that sounded similar to “sisters,” put in a proposal for the club with the Student Association, and CSters became an official club at Rice. CSters began by meeting for monthly lunches in the spring of 2002. Seventeen years later, the monthly lunches are still occurring and the club has grown from a few members to 150 active participants. “It was definitely encouraging to hear other women talk about their experiences in CS classes and internships and realize you were not the only one that felt intimidated or to admit you might be struggling in a class. It connected you to upperclassmen who could help you determine which classes best fit your interests and personality, and whom to turn to as a resource. You also got to know the other CS women at Rice and it was enjoyable to connect with others in your CS class instead of mainly working with your assigned partners,” said Poonawala. After she helped found CSters, Poonawala took off for Spain for a semester of study abroad – something she had set her heart on from the moment she learnt about Rice’s study abroad option. She had chosen Rice in part for its strong study abroad program. Because she was determined to spend a semester abroad in a non-English speaking country, her transfer credit options were limited. It meant missing out a semester of CS classes and not being able to take subsequent classes with her cohort, but Poonawala said the value she received navigating through an unfamiliar environment outweighed remaining at Rice all four years and pursuing a B.S. instead of a B.A. degree. In fact throughout her four years at Rice, each semester, her coursework was a balance of CS major related courses and non-technical courses that interested her; Anthropology, MUSI 101 – learning to read music, and Cooking with Chef Rogers. Product Managers were not yet in vogue when Poonawala graduated from Rice. She worked as an application engineer and then moved into software development. While working as a developer, her company landed a large contract and she found herself meeting with the client to determine their requirements. “That experience helped me realize my strongest skill is not optimizing code. That did not excite me; rather, I enjoyed figuring out what a client needs and how we could provide that to them. Being a liaison with a technical degree enables me to be successful communicating with both clients and the tech team,” she said. She also thrives on the variety that comes with working for a consulting agency. After 12 years working on enterprise software in healthcare, Poonawala decided she needed a new experience. Regardless of her client’s technology stack, Poonawala savors her role as the liaison. She said a good day at work is when she can make things happen for her engineering team by fixing a communications gap or collecting feedback. “If a client seems to be unreasonable, it’s my job to find out what’s behind their frustration, to explain our tech limitations and get them on board with the engineers. I love days when I can have an open and honest conversation with a client and help set expectations by being realistic about a deadline, explaining the impact of a scope change, or identifying roadblocks and what we need to move past them.